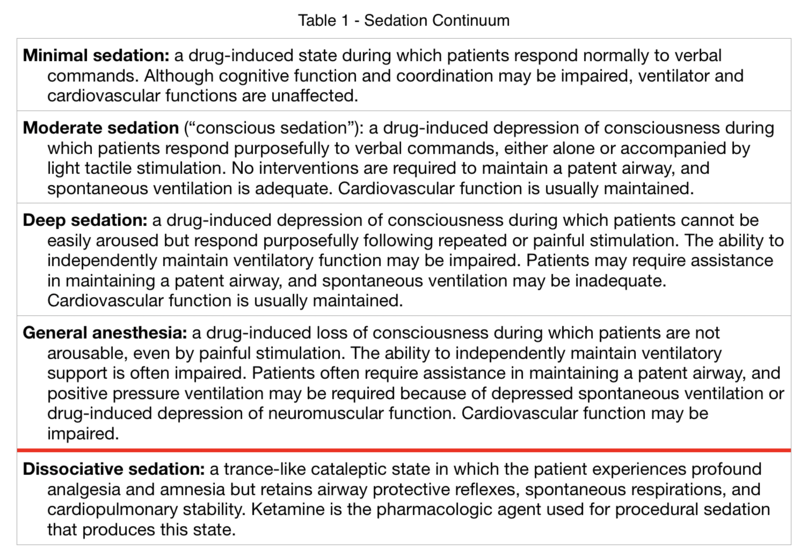 The term conscious sedation is synonymous with moderate sedation; since contemporary best practice in emergency medicine includes deep sedation, dissociative sedation, and general anesthesia–where patients are unconscious–conscious sedation is no longer an appropriate term to describe this technique and should not be used. The use of modern anesthetic agents to effect deep sedation in emergency departments has reduced patient suffering and improved procedural success; this represents an elevation in the quality of emergency care, but entails airway, breathing, and circulatory risk. Emergency clinicians–who provide PSA across the entire sedation continuum–must therefore be expert in recognizing and managing the potentially dangerous effects of drug-induced unconsciousness so that painful procedures can be performed both humanely and safely. Providers often focus on selecting the right drug and dose, but cognitive and material preparation are more important; when PSA adverse effects are anticipated and optimally addressed, nearly any anesthetic agent can be used safely and effectively. We recommend the use of a PSA checklist which, by prompting the clinician along the many steps and details in preparing for and executing PSA, allows cognitive energies to be conserved for more complex tasks. The most important question for the emergency provider to consider prior to initiating procedural sedation is whether the patient is a good candidate for emergency department-based procedural sedation. Unlike endotracheal intubation, PSA is rarely an emergent procedure; It is therefore even more crucial that emergency providers assess anesthetic risk prior to PSA by estimating cardiorespiratory reserve and difficult airway features (including obstructive sleep apnea), weigh this risk against procedural urgency, and consider alternatives to ED-based PSA when appropriate. The need for fasting prior to procedural sedation is controversial. In 2014, the American College of Emergency Physicians published a clinical policy stating, as a level B recommendation, “Do not delay procedural sedation in adults or pediatrics in the ED based on fasting time.” Preprocedural fasting for any duration has not demonstrated a reduction in the risk of emesis or aspiration when administering procedural sedation and analgesia.” (Godwin 2014) Whereas the benefits of preprocedural fasting are theoretical and undemonstrated, whenever PSA is delayed for fasting, there is harm: The patient may be in pain longer as well as hungry/thirsty, the procedure may become more difficult by the delay, and ED resources are stretched as length of stay is extended. Personnel will vary by environment, but a medical professional not performing the procedure should be present to monitor the patient. If the procedure is predicted to be long or if the patient has a higher anesthetic risk, a resuscitation and airway-skilled clinician dedicated to monitoring is advised. Compromise of airway and breathing are by far the most important complications during PSA; since these events are definitively managed by endotracheal intubation, preparation for PSA therefore always includes being fully prepared for endotracheal intubation–all relevant airway equipment should be brought to bedside, and appropriate RSI medications readily available. If the patient is in pain (e.g. from an orthopedic injury), aggressive preprocedural analgesia allows for lower sedative doses during PSA, in addition to being proper care for patients in pain. Titrated parenteral opioids are often appropriate in this context, but opioid alternatives (including analgesic-dose ketamine), may also be used. Monitoring the patient with capnography during procedural sedation is still another area of controversy. (Mohr 2013, Terp 2013) Capnography detects hypoventilation with high sensitivity and evidence demonstrates that providers recognize hypoventilation earlier when capnography is used. (Waugh 2011) However, use of capnography has not been demonstrated to reduce the incidence of patient-oriented serious adverse events during ED-based PSA; perhaps because these events are rare. Expired CO2 monitoring may alarm or show a deviated tracing either falsely or in reflection of a change in patient status that, undetected, would have had no consequence. In addition to the cognitive harms of distraction, providers may take actions in response to these capnography “false positives” that may be harmful–most importantly, bag mask ventilation. The ACEP clinical policy makes the following Level B recommendation: “Capnography may be used as an adjunct to pulse oximetry and clinical assessment to detect hypoventilation and apnea earlier than pulse oximetry and/or clinical assessment alone in patients undergoing procedural sedation and analgesia in the ED.” (Godwin 2014) Because capnography allows hypoventilation to be easily detected while supplemental oxygen is provided, we recommend capnography monitoring, combined with a stepwise approach to hypoventilation that minimizes the chance that over-detection of hypoventilation will cause harm. The airway may be compromised during procedural sedation by two related but distinct mechanisms. Airway obstruction occurs when the flow of air is blocked; compromise of airway patency may arise from malpositioning of the head or neck, collapse of the oropharyngeal soft tissues, pooling of secretions (or a foreign body, such as dentures), or laryngospasm. Failure to protect the airway occurs when the gag, cough, ahem (throat clearing) and swallowing airway reflexes are diminished or abolished (during PSA, by chemically depressing level of consciousness). Loss of airway reflexes is not dangerous in and of itself but may result in the immediately dangerous complications of airway obstruction or aspiration. Breathing is compromised in PSA by hypoventilation. Oxygenation should not be impaired during PSA–if oxygenation is a problem, i.e. the patient has significant lung disease–that patient is likely not a good candidate for ED-based PSA. 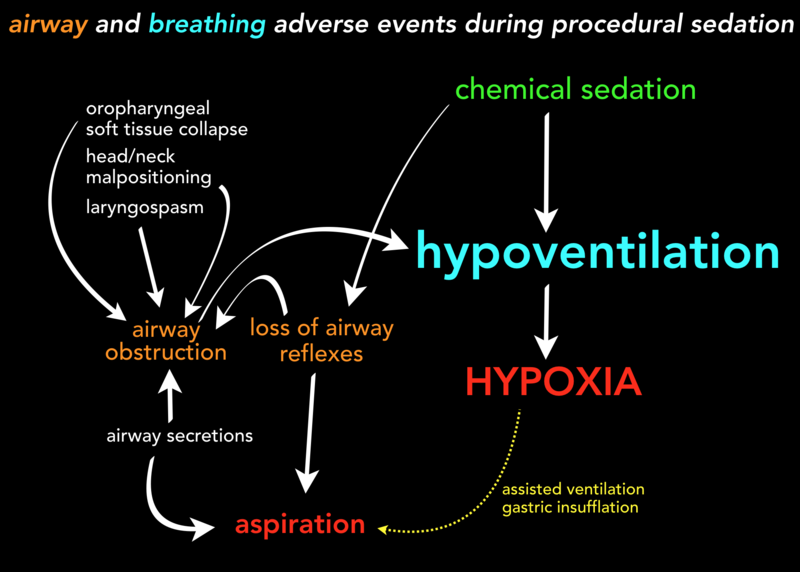 Hypoventilation occurs during PSA either from airway obstruction, or centrally, from chemical sedation. Carefully monitoring ventilation and correctly intervening on hypoventilation is the most important aspect of safe procedural sedation, as discussed below. Circulatory adverse events that require intervention during PSA are uncommon. Many patients who receive ketamine will develop hypertension and tachycardia, patients who receive propofol or a conventional sedative may become hypotensive or bradycardic. These vital sign abnormalities rarely cause patient-oriented sequelae and generally self-resolve. Emesis is uncommon during dissociative or deep sedation but is an important adverse event because vomiting that occurs while airway reflexes are compromised may result in pulmonary aspiration. Nausea and vomiting when airway reflexes are intact, such as during or after the patient emerges from procedural sedation, is very common and may be treated with usual antiemetics. Anaphylaxis to procedural sedation agents is very uncommon but if a PSA patient develops rash, wheezing, angioedema or hypotension, a drug reaction must be considered and if suspected, treated in the usual fashion. Much more common is an idiosyncratic reaction to ketamine; this truncal confluent or patchy erythematous rash is non-allergic and requires no treatment. A variety of less important adverse events may occur during PSA, depending on the agents used. Hypertonicity or myoclonus are seen frequently with ketamine or etomidate; ketamine is also associated with hypersalivation. Psychiatric adverse events, seen especially on emergence from ketamine dissociation, is discussed separately. The mechanisms that support airway and breathing during PSA are three: airway patency, airway reflexes, and ventilation. Because ED-based PSA should be performed on patients with good lung function, oxygenation should not be a concern if ventilation is adequate. Hypoxia is the most dangerous common consequence of PSA, so providers performing PSA are rightly attuned to oxygenation, as measured by the pulse oximeter; however, if the patient is receiving supplemental oxygen, using oxygen saturation as the principle marker of safety during PSA is an error. The margin of safety during PSA is reflected not by oxygenation but ventilation, which demonstrates airway patency and demonstrates adequate respiratory effort. Ventilation, not oxygenation, should therefore be the focus of attention during PSA. Monitoring ventilation is thus a high priority for PSA providers, for which there are a variety of techniques. The most basic is observing chest rise. Though assessing chest rise can be misleading, (Poulton 2011, Soto 2004) it is a fundamental aspect of sedation practice. The patient’s anterior thorax should therefore either be exposed or covered by clothing that is sufficiently form-fitted that chest and abdominal excursion is easily appreciated. Continuous auscultation of the lungs with a conventional stethoscope is impractical, but breath sounds (and heart sounds) can be effectively monitored during PSA using a precordial stethoscope, which attaches to the patient’s chest and transmits sound to an earpiece worn by the clinician. Pulse oximetry easily, cheaply, non-invasively and accurately measures blood oxygenation, a crucial endpoint during procedural sedation; the pulse oximeter is therefore a crucial monitoring device. When a well-perfused patient is breathing room air, saturation corresponds well with ventilation. However, as discussed above, providing supplemental oxygen to a patient with normal lungs weakens the relationship between saturation and ventilation. It is therefore a mistake to assume that a well-saturated patient receiving supplemental oxygen during PSA is doing well; such a patient may be profoundly hypoventilating or even apneic, dangerously acidemic, and may have completely abolished airway reflexes. The well-saturated PSA patient may therefore have precarious physiology–physiologic reserve during PSA arises from ventilation. The most accurate method for monitoring ventilation is capnography. Waveform capnography is the plot of exhaled carbon dioxide over time, an accurate reflection of ventilation. In addition to the waveform, capnographs display the partial pressure of carbon dioxide at the last moment of exhalation (ETCO2), as well as an accurate respiratory rate. The accuracy of capnography can be diminished if the sampling port samples only the mouth or nose and the patient is breathing through the other orifice; better devices sample both. If a source of supplemental oxygen is close to the ETCO2 sampling port, the ETCO2 value may be washed out and therefore falsely low, though the waveform shape is otherwise preserved. PSA patients develop hypoventilation either by breathing with preserved tidal volumes and a lower respiratory rate (bradypneic hypoventilation), which results in higher expired CO2 values (and therefore a taller waveform), or with reduced tidal volumes and a normal or reduced respiratory rate (hypopneic hypoventilation), which results in lower CO2 values as a larger fraction of expired air never participated in gas exchange (i.e. increased dead space). The tracing and ETCO2 value must therefore be interpreted over time and in the context of other parameters and exam findings. (Krauss 2007) Significant changes in the waveform or increases/decreases in the ETCO2 value ≥20 mmHg during PSA usually represent hypoventilation. The absence of an end tidal tracing less ambiguously demonstrates the cessation of airflow, either from obstruction or central hypoventilation. The first step is to detect hypoventilation early, using the monitoring techniques described above. Early detection is the primary task of the PSA provider, as late recognition of hypoventilation–e.g. once the saturation falls–necessitates hurried, aggressive interventions that are more likely to cause harm. 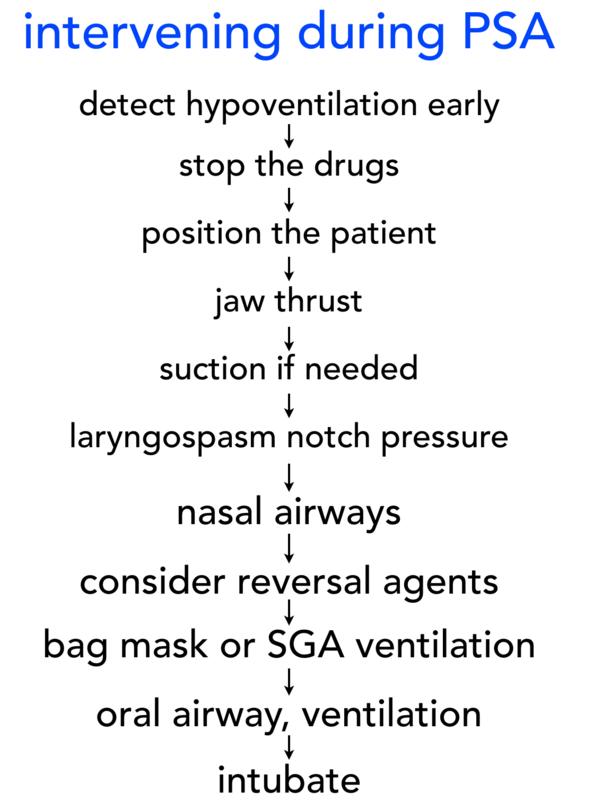 When hypoventilation is identified at its outset, the provider can proceed down the PSA intervention sequence slowly, calmly, safely. The first response to hypoventilation is to stop or slow the drugs. Often the hypoventilating PSA patient is simply poorly positioned. Reposition the patient to maximize ventilation by bringing the head and neck into proper alignment, performing a chin lift, and raising the head of the bed, which both improves respiratory mechanics and reduces aspiration risk. If ventilation is still inadequate, the next step is to perform a jaw thrust. (Figure – Jaw Thrust) A jaw thrust is correctly performed by displacing the mandible anteriorly, so that the lower incisors are pushed in front of the upper incisors. This is best accomplished by stabilizing the thumbs on the maxilla and placing four fingers posterior to the ramus of the mandible; this allows the strong hand and forearm muscles to be mobilized to overcome the masseters, which may offer considerable resistance in a non-paralyzed patient. These basic maneuvers will restore ventilation in many patients. If hypoventilation persists, suction of the oropharynx–mindful of a potentially active gag reflex– is indicated if there are significant secretions, and apply pressure at the laryngospasm notch. This pressure point is located behind the earlobe, between the mastoid and mandibular condyle. Bilateral firm pressure applied medially and cephalad with a single finger, while maintaining a jaw thrust, is touted to trigger the superior cervical sympathetic ganglion (Larson 1998) and also provides a very painful stimulus. If none of these maneuvers have restored ventilation, prepare for assisted ventilation by inserting two lubricated nasal airways (slowly and gently, to avoid epistaxis), which will make bag mask ventilation more effective and provide another irritating stimulus. Consider administering a reversal agent (flumazenil or naloxone) if the patient has been treated with a benzodiazepine or opioid. The next step is bag mask ventilation. This should be done only when ventilation is inadequate to support oxygen saturation and with deliberate attention to excellent technique with two hands on the mask, both thumbs down, the other four fingers of each hand gathering the jaw into a jaw thrust. An assistant bags slowly and gently–a patient with normal lungs will reoxygenate with just a few assisted breaths. Properly performed bag mask ventilation will be effective in almost every case; if bagging is unsuccessful, an oral airway may be inserted, prior to a repeat BVM attempt, with attention paid to the potential for this device to stimulate gagging and possibly emesis. Rarely, a hypoventilating, hypoxic PSA patient cannot be successfully bag mask ventilated, which is an indication for the last step in the PSA intervention sequence, endotracheal intubation. As an alternative to the bag mask device, assisted ventilation can be performed with a supraglottic device, such as a laryngeal mask airway. Supraglottic device ventilation is more effective than bag mask ventilation, easier to perform, and less likely to insufflate the stomach. These notable advantages must be weighed against the potential for a supraglottic device to cause gagging or, dangerously, vomiting. However, once the obstructive causes of hypoventilation have been addressed by performing the maneuvers at the top of the PSA intervention sequence, hypoventilation is very likely to be central hypoventilation from brainstem sedation; a supraglottic device is therefore likely to be well tolerated. However, if a supraglottic device is used in a non-paralyzed patient, close attention must be paid to signs of discomfort, which suggest that sedation is lightening and the device should be removed. Ketamine has emerged as the procedural sedation agent of choice in both adults and children in many centers. Ketamine is not a conventional sedative, it is a dissociative anesthetic that, when used in sufficient doses, produces complete analgesia, amnesia, and unconsciousness by isolating the patient from external stimuli. Ketamine distinguishes itself from alternatives by rendering the patient still and impervious to any painful stimulus at the same time that airway reflexes are preserved and breathing and circulatory tone are augmented. Ketamine has rapid onset and dose-dependent duration of action; at standard dissociative doses (1-2 mg/kg IV), duration of action is 15-30 minutes. Unlike most other PSA agents, ketamine has excellent pharmacokinetics by the intramuscular route, an important advantage when starting an IV is difficult or undesirable, as in children or cognitively disabled adults. Ketamine is less potent when given IM; the dose is 4-6 mg/kg IM. Though airway reflexes and respiratory drive are maintained, a rapid bolus of dissociative-dose ketamine may cause a brief period of apnea; this is self-resolving and can be avoided by infusing ketamine over 30-60 seconds, which will generally require dilution. Hypoventilation and apnea can occur during ketamine PSA from a variety of mechanisms (head/neck malpositioning, laryngospasm, secretions); monitoring for hypoventilation is therefore no less important with ketamine than with alternatives. Laryngospasm is more common in children and presents across a spectrum from noisy breathing to complete obstruction– chest movement without air movement. Ketamine causes release of endogenous catecholamines, hypertension and tachycardia are common when dissociative-dose ketamine is used. Hyperdynamic vitals rarely require intervention during ED-based PSA. However, if the patient has significant cardiac disease, an abrupt increase in myocardial oxygen demand may be deleterious. Dissociated patients may have increased muscle tone or even rigidity, which can interfere with with joint and fracture reduction. Hypersalivation occurs more commonly in children, and generally requires no intervention or a brief period of suctioning. Atropine or glycopyrrolate are sometimes used to reduce secretions. Nausea and vomiting are common post-procedure and are effectively treated or prevented with ondansetron. The adverse effect of greatest interest when ketamine is used for PSA on adults is psychiatric distress on emergence. The fully dissociated patient is unconscious and unaware; however, as ketamine is metabolized the patient will pass through partial dissociation and may feel disconnected from their body and reality as sensory stimuli are reintegrated into perception. Most will pass smoothly through partial dissociation to lucidity, however some will find these psychoperceptual disturbances terrifying and may demonstrate severe emotional distress, often screaming or crying. Although upsetting to all involved, the possibility of psychiatric emergence phenomena should not preclude the use of ketamine, when ketamine would otherwise be the best PSA agent; ketamine-related psychiatric distress can be effectively prevented, anticipated and treated. How a patient feels during and emerging from ketamine dissociation depends on their expectations of dissociation and how they feel as they enter into dissociation. Pre-induction analgesia is valuable in this regard and is also good patient care, as described above. Use of a benzodiazepine or neuroleptic prior to ketamine dissociation may reduce the incidence of emergency phenomena but may make respiratory complications more likely. (Chudnofsky 2000, Sener 2010). Prophylactic anxiolysis is generally unnecessary unless the patient is particularly anxious or agitated. Pre-induction coaching may reduce the likelihood of emergency distress: (Cheong 2011) explain to the patient that they are going to receive a drug that will cause very vivid dreams, but that they can control their dreaming, so imagine a desirable scenario, like a beautiful beach or mountaintop. Signs of psychiatric distress should be anticipated, and if psychiatric distress develops, it is effectively treated with a conventional sedative such as a small bolus of propofol or a sedating dose of midazolam or droperidol. Propofol in particular also effectively attenuates ketamine-related hypertension, when hypertension is thought to require treatment, as well as hypertonic muscle tone. Propofol is a potent sedative and at standard PSA doses can cause hypotension, respiratory depression, and impairment of airway reflexes. Emergency providers can mitigate the likelihood that these dangerous effects will cause harm by taking advantage of propofol’s uniquely brief duration of action. Although propofol can be used effectively in small aliquots or as a continuous infusion, we recommend dosing propofol as a single induction bolus predicted to cause sufficient sedation to perform the procedure. In healthy adults under age 50, a quick bolus of 1 mg/kg usually effects unconsciousness (and often a brief period of hypoventilation). If the first dose is inadequate within 90 seconds, a second dose, generally half the initial dose, should be given promptly so as not to allow the initial dose to dissipate. Further doses should be given cautiously, at one-quarter to one-half the initial dose, as needed. Etomidate is an imidazole non-benzodiazepine, non-barbiturate GABA modulator very widely used as an induction agent for rapid sequence intubation in the US. Etomidate benefits from rapid onset and is the most hemodynamically neutral of all PSA agents. The usual dose for procedural sedation is 0.1-0.2 mg/kg and in that range produces deep sedation of duration between propofol and ketamine; 5-15 minutes. Etomidate is safe and effective in ED-based PSA, (Vinson 2002) though apnea occurs in 5-10% of patients. Nausea and vomiting occur often post-procedure, but the most prevalent concern when using etomidate for PSA is muscle rigidity and myoclonus, which is common and can be severe enough to interfere with the procedure. (Falk 2004) Etomidate is epileptogenic and should be avoided in patients with a seizure disorder. Fentanyl and midazolam have been used together to facilitate PSA in emergency settings for decades. They are combined because fentanyl produces little sedation in subanesthetic doses and midazolam produces no analgesia. Fentanyl is generally dosed at 0.5-1 mcg/kg (50-100 mcg in a typical adult) and midazolam at 0.025-0.075 mg/kg (2-5 mg in a typical adult). Though this combination has a long record of safe use, it is more likely to cause adverse events than modern alternatives. (Sacchetti 2007, Bellolio 2016, Bailey 1990) Both fentanyl and midazolam are comparatively difficult to titrate, due to their longer time to onset (2-3 minutes for midazolam and 3-5 minutes for fentanyl), which can lead to either undersedation, exposing the patient to painful stimuli, and oversedation, causing hypoventilation and apnea. Fentanyl and midazolam can both be reversed, however, by naloxone and flumazenil, respectively. Nitrous Oxide (N2O) is a gas administered with oxygen in 30%-70% admixture to produce mild to moderate sedation, analgesia, amnesia and anxiolysis, with rapid onset and offset. N2O has a long record of efficacy and safety (ESA 2015) and its inhalational route requires no intravenous access nor an IM injection. N2O does not produce adequate anesthetic depth to facilitate very painful procedures but is an excellent choice for facilitating lesser procedures such as laceration repair and abscess drainage, especially in an anxious patient and in combination with local anesthesia. It must be delivered via a specialized device that can scavenge escaped gas and is contraindicated in closed-compartment lesions such as pneumothorax or bowel obstruction. Dexmedetomidine is sympatholytic α-2 agonist typically delivered by a loading dose infusion followed by a maintenance infusion. Its non-opioid, non-GABA action delivers sedation and analgesia without respiratory depression but with predictable bradycardia and sometimes hypotension. Dexmedetomidine may find a role for non-painful procedures or as an adjunct to other agents such ketamine (Tobias 2012), where it counteracts ketamine’s adverse effects similarly to propofol, without the respiratory depression associated with propofol. As monotherapy, its more complicated dosing and slower onset limit its adoption as an agent for ED-based PSA. Choosing the right PSA agent. The weight of evidence supports the use of propofol or ketamine (or their combination) as first choices to facilitate painful procedures in the emergency department, with etomidate a third choice due its tendency to cause myoclonus and nausea. We recommend propofol monotherapy for brief procedures, especially when muscle relaxation is important, such as joint reduction or cardioversion of the stable patient. Ketamine’s longer duration of action, cardiorespiratory stability and post-procedural analgesia make it well suited for most other ED-based PSA scenarios. Propofol should be avoided when hypotension or respiratory depression are a particular concern. Despite a listed contraindication in the prescribing information, the literature does not support such an association, and propofol is widely considered to not be contraindicated in patients with an egg or soy allergy. (AAAAI 2016, Wiskin 2015, SPS 2010) There are a variety of cited contraindications to ketamine, most of them poorly supported by literature. (Green 2011) However, we would avoid ketamine monotherapy in the uncommon PSA patient where a rise in blood pressure or heart rate would be dangerous. As discussed above, more important than the choice of PSA agent is thoughtful preparation for the procedure, vigilant monitoring during the procedure, and appropriately preventing and intervening on adverse events when they arise. There is little evidence to guide post-procedural practice but institutional guidelines are legion. An airway-capable provider should remain at bedside at least until the patient responds to voice. If a reversal agent was given during PSA, a 2-3 hour period of monitoring is indicated; otherwise hemodynamic monitoring should continue until the patient is conversant and has normal respiratory and cardiovascular function. PSA patients are ideally discharged with a companion. Patients who must leave unaccompanied must be explicitly determined to have completely returned to their cognitive and neuromuscular baseline. Driving is traditionally proscribed for 12-24 hours. Because of the likelihood of amnesia, clear written discharge instructions detailing all relevant aspects of provided care as well as the expected course, followup, and indications for immediate return should be provided. The author thanks Nicholas Chrimes, MD for his review of the manuscript and thoughtful suggestions. The author reports no relevant conflicts of interest. AAAAI. Soy-allergic and egg-allergic patients can safely receive propofol anesthesia. https://www.aaaai.org/conditions-and-treatments/library/allergy-library/soy-egg-anesthesia. Accessed October 8, 2016. Afshan G. Are We, Anesthesiologists, Aware About the Incidence of Muscle Stiffness Associated With Remifentanil? Anesth Pain. 2012;1(3):218. Andolfatto G, Abu-Laban RB, Zed PJ, Staniforth SM, Stackhouse S, Moadebi S, Willman E. Ketamine-propofol combination (ketofol) versus propofol alone for emergency department procedural sedation and analgesia: a randomized double-blind trial. Ann Emerg Med. 2012 Jun;59(6):504-12.e1-2. Bailey PL, Pace NL, Ashburn MA, et al. Frequent hypoxemia and apnea after sedation with midazolam and fentanyl. Anesthesiology. 1990;73:826-830. Bellolio MF, Gilani WI, Barrionuevo P, Murad MH, Erwin PJ, Anderson JR, Miner JR, Hess EP. Incidence of Adverse Events in Adults Undergoing Procedural Sedation in the Emergency Department: A Systematic Review and Meta-analysis. Acad Emerg Med. 2016 Feb;23(2):119-34. Cheong SH, Lee KM, Lim SH, Cho KR, Kim MH, Ko MJ, Shim JC, Oh MK, Kim YH, Lee SE. Brief report: the effect of suggestion on unpleasant dreams induced by ketamine administration. Anesth Analg. 2011 May;112(5):1082-5. Chudnofsky CR, Weber JE, Stoyanoff PJ, Colone PD, Wilkerson MD, Hallinen DL, Jaggi FM, Boczar ME, Perry MA. A combination of midazolam and ketamine for procedural sedation and analgesia in adult emergency department patients. Acad Emerg Med. 2000 Mar;7(3):228-35. Dunn MJ, Mitchell R, Souza CD, Drummond G. Evaluation of propofol and remifentanil for intravenous sedation for reducing shoulder dislocations in the emergency department. Emerg Med J. 2006 Jan;23(1):57-8. Elliott P, O’Hare R, Bill KM, Phillips AS, Gibson FM, Mirakhur RK. Severe cardiovascular depression with remifentanil. Anesth Analg. 2000 Jul;91(1):58-61. Euasobhon P, Dej-Arkom S, Siriussawakul A, Muangman S, Sriraj W, Pattanittum P, Lumbiganon P. Lidocaine for reducing propofol-induced pain on induction of anaesthesia in adults. Cochrane Database Syst Rev. 2016 Feb 18;2:CD007874. European Society of Anaesthesiology task force on use of nitrous oxide in clinical anaesthetic practice. The current place of nitrous oxide in clinical practice: An expert opinion-based task force consensus statement of the European Society of Anaesthesiology. Eur J Anaesthesiol. 2015 Aug;32(8):517-20. Falk J, Zed PJ. Etomidate for procedural sedation in the emergency department. Ann Pharmacother. 2004 Jul-Aug;38(7-8):1272-7. Ferguson I, Bell A, Treston G, New L, Ding M, Holdgate A. Propofol or Ketofol for Procedural Sedation and Analgesia in Emergency Medicine-The POKER Study: A Randomized Double-Blind Clinical Trial. Ann Emerg Med. 2016 Jul 22. Gharavifard M, Tafakori A, Zamani Moghadam H. Remifentanil versus Fentanyl/Midazolam in Painless Reduction of Anterior Shoulder Dislocation; a Randomized Clinical Trial. Emerg (Tehran). 2016 Spring;4(2):92-6. Godwin SA, Burton JH, Gerardo CJ, Hatten BW, Mace SE, Silvers SM, Fesmire FM; American College of Emergency Physicians. Clinical policy: procedural sedation and analgesia in the emergency department. Ann Emerg Med. 2014 Feb;63(2):247-58.e18. Green SM, Andolfatto G, Krauss BS. Ketofol for procedural sedation revisited: pro and con. Ann Emerg Med. 2015 May;65(5):489-91. Green SM, Roback MG, Kennedy RM, Krauss B. Clinical practice guideline for emergency department ketamine dissociative sedation: 2011 update. Ann Emerg Med. 2011 May;57(5):449-61. Krauss B, Hess DR. Capnography for procedural sedation and analgesia in the emergency department. Ann Emerg Med. 2007 Aug;50(2):172-81. Epub 2007 Jan 12. Larson CP Jr. Laryngospasm–the best treatment. Anesthesiology. 1998 Nov;89(5):1293-4. Miner JR, Gray RO, Stephens D, Biros MH. Randomized clinical trial of propofol with and without alfentanil for deep procedural sedation in the emergency department. Acad Emerg Med. 2009 Sep;16(9):825-34. Miner JR, Moore JC, Austad EJ, Plummer D, Hubbard L, Gray RO. Randomized, double-blinded, clinical trial of propofol, 1:1 propofol/ketamine, and 4:1 propofol/ketamine for deep procedural sedation in the emergency department. Ann Emerg Med. 2015 May;65(5):479-488.e2. Miner JR, Moore JC, Plummer D, Gray RO, Patel S, Ho JD. Randomized clinical trial of the effect of supplemental opioids in procedural sedation with propofol on serum catecholamines. Acad Emerg Med. 2013 Apr;20(4):330-7. Mohr NM, Wessman B. Continuous capnography should be used for every emergency department procedural sedation. Ann Emerg Med. 2013 Jun;61(6):697-8. Patanwala AE, Christich AC, Jasiak KD, Edwards CJ, Phan H, Snyder EM. Age-related differences in propofol dosing for procedural sedation in the Emergency Department. J Emerg Med. 2013 Apr;44(4):823-8. Pediatric Sedation Blog. “Egg Anaphylaxis and Propofol.” Society for Pediatric Sedation, 15 June 2010. Web. 02 Jan. 2017. <http://blog.pedsedation.org/?p=136>. Phillips WJ, Halpin J, Jones J, McKenzie K. Remifentanil for procedural sedation in the emergency department. Ann Emerg Med. 2009 Jan;53(1):163. Porhomayon J, El-Solh AA, Pourafkari L, Jaoude P, Nader ND. Applications of Nasal High-Flow Oxygen Therapy in Critically ill Adult Patients. Lung. 2016 Oct;194(5):705-14. Poulton DA, Schmölzer GM, Morley CJ, Davis PG. Assessment of chest rise during mask ventilation of preterm infants in the delivery room. Resuscitation. 2011 Feb;82(2):175-9. Remick J, Sacchetti A, Bages G, Delagol K. Noninvasive positive pressure ventilation in procedural sedation. Am J Emerg Med. 2010 Jul;28(6):750.e1-3. Sacchetti A, Jachowski J, Heisler J, Cortese T. Remifentanil use in emergency department patients: initial experience. Emerg Med J. 2012 Nov;29(11):928-9. Sacchetti A, Senula G, Strickland J, Dubin R. Procedural sedation in the community emergency department: initial results of the ProSCED registry. Acad Emerg Med. 2007 Jan;14(1):41-6. Sener S, Eken C, Schultz CH, Serinken M, Ozsarac M. Ketamine with and without midazolam for emergency department sedation in adults: a randomized controlled trial. Ann Emerg Med. 2011 Feb;57(2):109-114.e2. Smith I, Avramov MN, White PF. A comparison of propofol and remifentanil during monitored anesthesia care. J Clin Anesth. 1997 Mar;9(2):148-54. Soto RG, Fu ES, Vila H Jr, Miguel RV. Capnography accurately detects apnea during monitored anesthesia care. Anesth Analg. 2004 Aug;99(2):379-82, table of contents. Strayer RJ, Caputo ND. Noninvasive ventilation during procedural sedation in the ED: a case series. Am J Emerg Med. 2015 Jan;33(1):116-20. Terp S, Schriger DL. Routine capnographic monitoring is not indicated for all patients undergoing emergency department procedural sedation. Ann Emerg Med. 2013 Jun;61(6):698-9. Tobias JD. Dexmedetomidine and ketamine: an effective alternative for procedural sedation? Pediatr Crit Care Med. 2012 Jul;13(4):423-7. Vinson DR, Bradbury DR. Etomidate for procedural sedation in emergency medicine. Ann Emerg Med. 2002 Jun;39(6):592-8. Waugh JB, Epps CA, Khodneva YA. Capnography enhances surveillance of respiratory events during procedural sedation: a meta-analysis. J Clin Anesth. 2011 May;23(3):189-96. Wiskin AE, Smith J, Wan SK, Nally MW, Shah N. Propofol anaesthesia is safe in children with food allergy undergoing endoscopy. Br J Anaesth. 2015 Jul;115(1):145-6. Witting MD, Hsu S, Granja CA. The sensitivity of room-air pulse oximetry in the detection of hypercapnia. Am J Emerg Med. 2005 Jul;23(4):497-500.